This creates a $20 Squidco Gift Certificate. 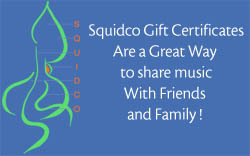 Gift Certificates are manually created at Squidco after we process your payment. We will send you an email confirming your order, and an email with a Gift Certificate image that you can email to your recipient, and information on how they can use that Gift Certificate on our site. Gift Certificates can be applied to any order at Squidco. Unused portions of gift certifcates are saved and available to the customer for subsequent orders.